Lino Likuveiqali satnding infront of his burnt home yesterday at Vunivau in Labasa yesterday. An attempt to kill termites with smoke has left two people at Vunivau, Labasa, homeless. Sailasa Vatucawaqa, who discovered termites in the three-bedroom house he lived in, decided to burn a drum filled with rubbish in an attempt to kill or get rid of the termites with smoke from the burning rubbish. The drum of rubbish was located beside the house. 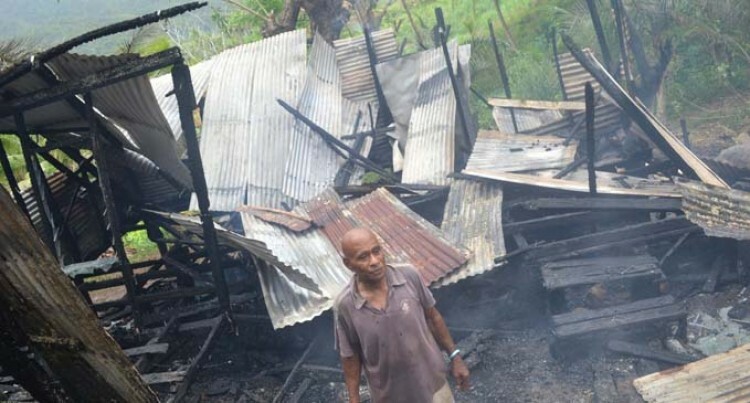 “I lit the drum that was filled with dried grass so that smoke can go underneath the house to kill the termites,” Mr Vatucawaqa said. A neighbour had alerted him to the fire. “When I went to the neighbour I looked back to see fire starting underneath the house. I ran back opened the front door only to see fire engulfing the house,” he said. Mr Vatucawaqa was living with another man, Lino Likuveiqali, 69. They are members of the new Methodist Church. Mr likuveiqali was at his farm at the time of the incident. Police spokesperson Inspector Atunaisa Sokomuri has confirmed the incident and is waiting on a report from the National Fire Authority (NFA). There have been 80 structural fires recorded so far, according to the NFA.